In doing some reading in preparation for a future presentation I am making, I came across a poem that I had yet the privilege of reading. 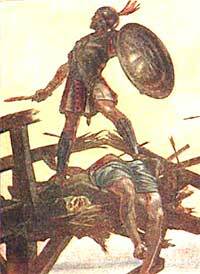 I had briefly heard the name Horatius, but never knew the background or the story behind the poem. This poem had a profound impact upon the life of Winston Churchill. In fact, Churchill liked it so much, he committed all 70 stanzas to memory. I was so moved by it that I have taken the liberty of summarizing the back story below and including a shortened version of the poem found at Brett and Kate McKay’s Art of Manliness. 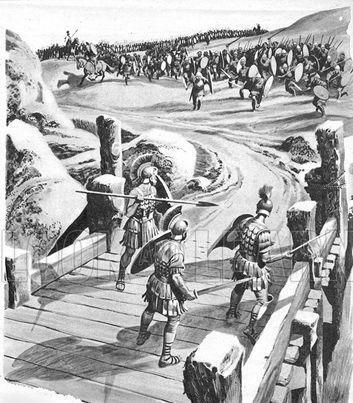 This ballad recounts the legendary courage of an ancient Roman army officer by the name of Publius Horatius Cocles. In 5 B.C., Rome rebelled against Etruscan rule and threw out their last king, Lucius Tarquinius Superbus, to form a republic. However, the king refused to leave and recruited another of the Etruscan rulers, Lars Porsena of Clusium, in order to try to overthrow the new Roman government and re-establish himself as king.